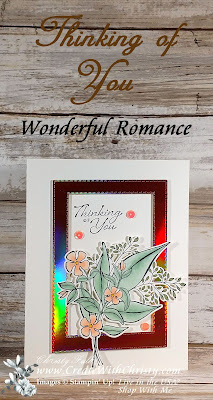 Today's card is the first card I've made using the Wonderful Romance Bundle from the Stampin' Up! 2019 Occasions Catalog. This stamp set, Wonderful Romance, and coordinating die set, Wonderful Floral Framelits, are so elegant! If you purchase these two items as a bundle, you'll save 10%. I can't wait until I can make more projects with this bundle! I'm really happy how this one turned out. How do you like that frame? 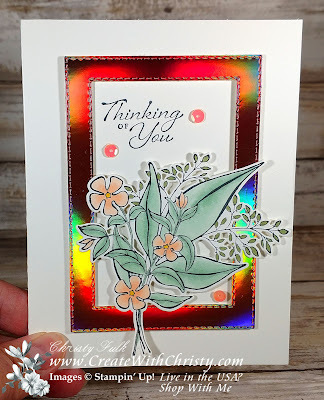 I made it with the new Rectangle Stitched Framelits from the Occasions Catalog, and Grapefruit Grove Foil from the Grapefruit Grove & Lovely Lipstick Foil Sheets from the 2019 Sale-A-Bration Brochure. 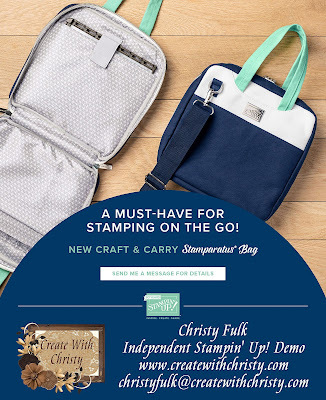 You can choose this as your FREE Sale-A-Bration when you place a $50 order (before shipping & tax). If you order from me, you'll also earn a doily when you use this month's host code. 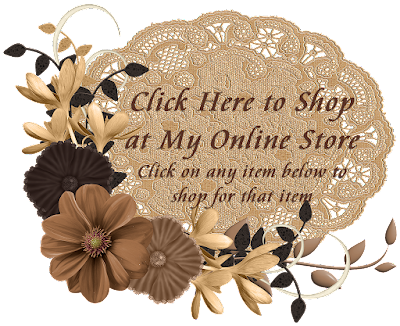 Once you earn 10 doilies, you'll get a $50 shopping spree from me, and I'll even pay for the shipping & tax! CLICK HERE to find out more! As you can see, the Grapefruit Grove Foil is also iridescent! It's so beautiful in person. I also love the stitched border on the inside and outside of the frame. This is made with the Rectangle Stitched Framelits. Want to see how these rectangle dies work, and learn some tips on how to color with Stampin' Blends? Then you'll want to watch my video below. 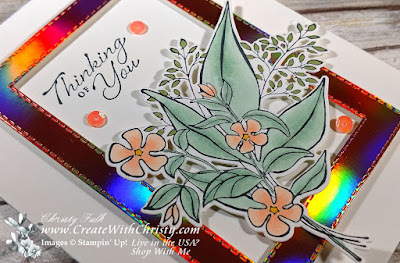 I demonstrate these things when making the card, along with showing you how to make the frame. I hope you like it!